When I was a little kid, once month or so, the family would go shopping, and hit the video store on a friday night, where I got to pick a game to rent. This was an exciting thing for me, as I never once got a new SNES game the whole time I had it, I can't remember if stores had stopped selling the games and the N64 had come out already, or if they were just too expensive. Whatever the case, this was my once chance to play games other then the 8 or so games I had. The reason I bring this up, is that I have had this vague memory of a game, I don't remember it being really good, in fact I couldn't get past the first level. I don't know why my mind has decided it is important to remember, but I can recall the entire first level in my head, but not the main character, or the name of the game. So for 10 years now, I've been trying to remember what this game was, so I could get rid of this small nagging thought in my head about it. spending the last hour going through each game on coolroms.com, like I do every year or so. 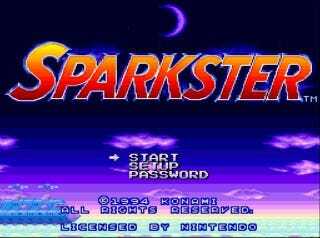 This time I've come to Sparkster, which is very similar in the first level being set mostly in a metal ship with a giant Knight as the boss, which is most of what I remember. Still though, this doesn't feel like the right game either. It's been so long though, has my nostalgia started to merge games into a clump of short lived rental memories? Or is there still a game I'm missing that isn't well known, but sits there waiting for me to find it. I remember a metal castle first level, a princess looking down from a castle balcony in the opening, it was an action sidescroller, and the first level layout was like this.